Perhaps you love grooming dogs and have decided to start your own professional grooming business. Maybe your pets are show dogs and you want them to look their best for competitions. Or, maybe you just want to keep your four-legged friend looking neat and clean all the time. Whatever the reason, a dog grooming table is an absolute must. Grooming tables for dogs makes the entire grooming process a lot easier for you, and must less stressful and safer for your furry pal. But, as with most dog products – dog food, interactive dog toys, dog activity monitors, GPS tracker for dogs (just to name a few) – there are so many options to dog grooming tables on the market. While having a lot of choice is certainly a great thing, it can also make it hard to select the best option to meet your needs. To help you find the best option, we have assembled a list of experts, including professional dog groomers and veterinarians to help use assess countless dog grooming tables. We have also read through dozens of dog grooming table reviews. After looking at the data we collected, we have narrowed down the options to what we consider to be the top five grooming tables for dogs. Now that you’ve seen our top choices for dog grooming tables, let’s take a more in-depth look at each option. Below, we offer a more detailed look at each of these grooming tables, including the features the offer, what we like about them, and what users have to say. Once you’ve read through the dog grooming table reviews and you’ve chosen the best option to meet your unique needs, click on the buttons to find the best prices on Chewy and Amazon. To start our list of the best grooming tables for dogs, we chose the Flying Pig Pet Foldable Grooming Table. This option is a great choice for large pets and/or for regular uses. This table measures 4 inches long, 24 inches wide, and 31.5 inches high, making it an ideal choice for grooming large breeds, including German Shepherds, Golden Retrievers, and St Bernards; however, it can also be used with medium and small breeds, including Poodles, West Highland White Terriers, and Cavalier King Charles Spaniels. The frame of this table is made of durable rust resistant stainless steel and it can easily accommodate up to 330 pounds of weight. The surfaces is shaped like a bone an features a textured non-slip rubber to keep your pup safe and secure. A heavy duty, adjustable, and foldable grooming arm with a noose and loop strap provides extra security, is easy to use, and won’t tug on your pet’s neck or fur. A storage basket on the bottom of the table is ideal for keeping your grooming tools close at-hand, such as dog shampoo, nail clippers for dogs, and a dog brush (or several). Final Verdict: If you’re looking for a large dog grooming table, than the Flying Pig Pet Foldable Grooming Table is definitely worth considering. It can accommodate heavy weights and is suitable for use with dogs of all sizes, including large breed dogs. Whether you are a professional dog groomer or you groom your own pets at home, than the Go Pet Club Pet Grooming Table with Arm will more than likely meet your needs. The wood table is covered with a waterproof material and features deluxe aluminum alloy edging to prevent warping. The surface of the table is non-slip, which improves the safety of the pooch standing on top of it. Additionally, the table is non-static, which prevents hair from standing on end and reduces the chances of static shock, thus making grooming a lot easier, more comfortable, and more effective. The table is supported by goal post style legs, which are constructed of lightweight, yet durable metal. All four legs are capped with rubber feet to prevent improve the stability of the table, prevent wobbling, and prevent damage to the floor underneath. The legs can also be folded up, which allows for easy transport and storage. 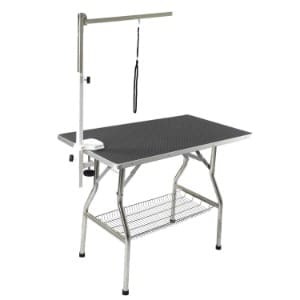 This grooming table also comes complete with an adjustable grooming arm and a leash loop. Final Verdict: For the price, we think that the Go Pet Club Bet Dog Grooming Table is a high-quality product. The waterproof, non-skid surface and the adjustable grooming arm and leash loop will keep your pet safe and secure. However, there were a few users that reported that the table arrived damaged, so make sure you contact the seller if you have experience any issues. Next up on our list of the best grooming tables for dogs is the Polar Aurora Pingkay Professional Grooming Table. 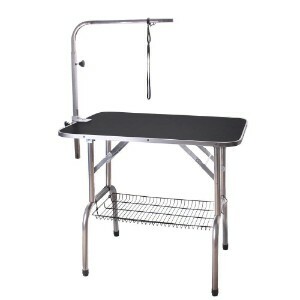 This grooming table is constructed of durable, high quality, rust resistant stainless steel. It measures 30 inches long, 18.5 inches wide, and 33.5 inches high, so it can easily accommodate dogs of all sizes. The surface is coated with a waterproof, non-slip, textured rubber surface. It will prevent your dog from slipping off, increase his comfort and safety, and make the grooming process easier for you, too. A 26 inch adjustable grooming arm is very easy to use. An under-table tool basket is the perfect place to keep all of your grooming essentials – dog ear cleaners, dog grooming clippers, toothbrushes for dogs, toothpaste for dogs, etc – close at hand so you don’t have to worry about stepping away to grab what you need. Lastly, the table is supported by foldable goal post legs, which make storing and transporting this dog grooming table a breeze. Final Verdict: For a high-quality, reasonably priced dog grooming table, the Polar Aurora Pingkay Professional Grooming Table is a good option. It offers several features that simplify the grooming process, including adjustable legs, a large weight capacity, and a static free surface. The Professional Foldable Pet Grooming Table from Yaheetech measures 32 inches long, 18 inches wide, and 30 inches tall, and it has a weight capacity of up to 220 pounds. It can easily accommodate pups’ of various sizes, and can be used comfortably by groomers of an average height. The anti-rust and corrosion-free surface provides longevity; the table is made to withstand long-term use and water damage. Goal post style, foldable legs allow for easy transport and storage. The four legs are capped with rubber feet to stabilize the table and make for a safer grooming environment. This grooming table comes complete with an adjustable grooming arm that adjusts to 31 inches, a buckle, and a leash loop. Underneath the table is a mesh basket, which can be used to store essential items; a dog hair dryer, flea treatment for dogs, and puppy shampoo, for example. It comes complete with an adjustable grooming arm, a leash loop, a buckle, and a storage basket. Final Verdict: If you are on the market for an affordable foldable pet grooming table, than you will likely be pleased with this option. Most reviewers said that they were pleased with the quality and construction. However, if you are on the taller side, you might prefer a table that has adjustable legs. Last, but definitely not least on our list of the best grooming tables for dogs, is the Gelinzon Dog Grooming Table. Featuring a heavy duty stainless steel frame, this table will not warp or rust. An anti-slip rubber material covers the surface of the table, which adds safety and security for your pet, and makes grooming easier for you, too. The table measures 36 inches long, 24 inches wide, and 29.3 inches high. The legs can be adjusted, which allows you to find the perfect height for your needs. Rubber feet on the bottoms of the legs prevent the table from slipping and increase the stability. This table comes equipped with two durable nooses, and a mesh storage tray on the bottom is the perfect spot to hold all of your grooming accessories. With a weight capacity of 250 pounds, this grooming table from Gelinzon can accommodate dogs of all sizes. Final Verdict: Whether you are looking for a professional grooming table for dogs or you are on the market for a grooming table for home use, the Gelinzon Dog Grooming Table will more than likely meet your needs. It’s well constructed, durable, adjustable, and can accommodate most dogs. Being a dog owner comes with a lot of responsibilities. Your top priority is to make sure that your furry friend is as healthy and happy as possible. To that end, you make sure that you get your pup the very best of everything: a durable dog crate; a comfortable and supportive dog bed; a spacious dog house; a safe outdoor dog kennel, and even a dog playpen that will keep him safe when you can’t keep your eyes on your four-legged companion. There’s another important component of caring for your four-legged family member that you don’t want to overlook. What is it? – Grooming! Grooming is an essential part of dog care. Not only does it help to keep your pup looking great and smelling fresh, but it also promotes better health. With regular grooming, you can prevent mats and tangles from developing in your pup’s coat, and built up dirt and debris is removed. Bathing, brushing, and clipping your pup’s coat also helps to promote healthier skin, as it helps to prevent infections, inflammation, and irritation. But, for some people (and some dogs) grooming can be a challenging task; and that’s where a dog grooming table comes in handy. If you aren’t quite sure what a grooming table for dogs is or you don’t know how it can benefit you, you’ve come to the right place! In this portion of our review, we share important information about dog grooming tables, including what they are, the benefits they offer, and the features that the best grooming tables offer. 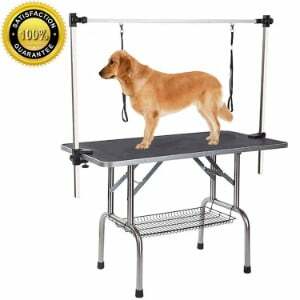 As the name suggests, a dog grooming table is a table that is specifically designed to for grooming pets. It offers a stable surface for your dog to sit or stand on while bathing, clipping, and brushing him. Grooming tables are made of a variety of materials and can be used with dogs of all shapes, sizes, and weights. Generally, professional groomers use these tools to simplify the process of grooming; however, pet owners can certainly use them, too. For example, if you have a pure breed dog and you plan on showing him in competitions, a grooming table can help to ensure that you give him the best possible clean and cut so that he can look at presentable as possible. These tables can also be use by pet owners who simply want to make the process of keeping their pups’ easy. They simplify the process of all aspects of grooming, including trimming, nail clipping, hair brushing, and even tooth brushing. Since the table holds the dog up higher, it allows the groomer to have easier access to the dog. It reduces the stress on the dog. Since the dog is easier to reach, it makes the process of grooming less anxiety inducing. It puts less physical stress on the groomer. Your back won’t ache as much because you won’t have to bend down to reach the dog. It allows you to reach areas on your dog that would generally be difficult to reach on the floor. 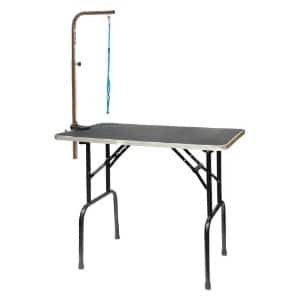 A grooming table improves the safety of the dog. They typically feature non-slip surfaces and leashes or nooses that keep the dog in place. 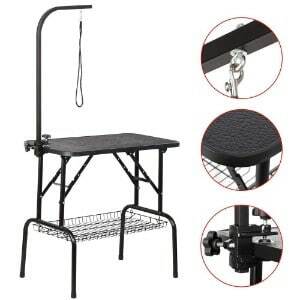 Of course, it stands to reason that you want to make sure that you choose a high quality grooming table for your pet. While the table is supposed to make the grooming process safer and easier, if it’s not well made or doesn’t offer must-have features, it will fail at doing the job that it’s supposed to do. There are a lot of grooming tables for dogs on the market, but they aren’t all created equal. With that said, here’s a look as some of the factors that you should take into consideration if you want to find the best option to meet your needs. The size. First and foremost, you want to ensure that the grooming table will be able to accommodate your pup. It should be long enough to fit him, as well as sturdy enough to support his weight. Keep his size in mind while you’re shopping so you can choose an option that will work for him. The construction. A grooming table should be highly durable. Since it will be holding a dog for a long period of time, you want to make sure that it can withstand his weight. Additionally, it should be able to stand up to wear and tear. Safety features. The best grooming tables for dogs will be outfitted with features that are intended to improve his safety. A non-slip surface will prevent him from falling; rubber feet will make the table more stable; an adjustable grooming arm will allow you to reach the ideal size for your pup’s safety. Additional features. Lastly, a high quality grooming table will be equipped with additional features that will make for easier use. For instance, a static free surface will prevent the risk of static cling and static shock. A storage basket will allow you to keep your grooming products close at hand. Grooming is a very important part of pet care. With a grooming table, the process can be made a lot easier. These tools are designed to improve your comfort and your dog’s safety while you are brushing and/or trimming his coat, while you are clipping his nails, and even while his teeth are being brushed. In fact, it’s because grooming tables make the grooming process so much easier that they are a must for professional dog groomers. In this review, we offers some insight into grooming tables for dogs, including their purpose, the benefits they offer, and the features that the highest quality tables feature. We have also offered in-depth reviews of our top five choices for the best dog grooming tables on the market. Whether you choose one of the tables that we recommended or you opt for your own, always remember that you should exercise the utmost care while you are tending to your pup’s grooming and maintenance needs. With the right table, you and your furry friend will be a whole lot happier!